Enjoy these Videos and Animations from the Molecular Design Institute and the Ward Group! 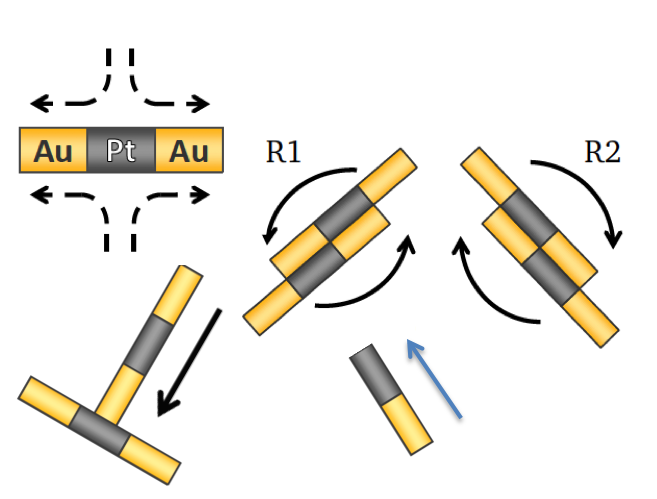 Micron-scale metal rods with uniform Au-Pt segments swim by self-electrophoresis when placed in a solution of hydrogen peroxide fuel. Electrochemical decomposition of hydrogen peroxide at the opposite ends of the rod produces a gradient in proton concentration, which corresponds to an electric field pointing from Pt to Au. The rods themselves have an overall negative charge, so the positively charged electrical double layer surrounding the rod experiences a force due to the self-generated electrical field. A fluid flow develops on the rod surface, from Pt to Au, causing the rod to swim with its Pt end leading. Real-time in situ Atomic Force Microscopy video of L-cystine growth, which is actuated by a screw dislocation that continuously generates spirals from the dislocation core. The hexagonal shape of the spiral hillocks reflects the hexagonal crystallographic symmetry.